All good geography students know that if you stand on top of the clubhouse and strain the eyes to the east as hard as you can, there lies Chile. We urge you to complete the nomination form accompanying this ToaLine and return per instructions. Nominations will only be called from the floor of the meeting if there are insufficient nominations received in advance. If you would like to know what is involved with any of the positions please contact either the incumbent or Michael. We work on a position being elected for two year term. Of course if circumstances require the term maybe reduced to one year prior to the following AGM. Again the AGM also occurred prior to publishing this newsletter to the site. Stay posted for and update on this in the next news letter. Left to right, Helene Tunnell, Trainer Alex Pol-glase, Has Brooke, Magda Paul, Matthew Scott and Ethan Tomaszyk. 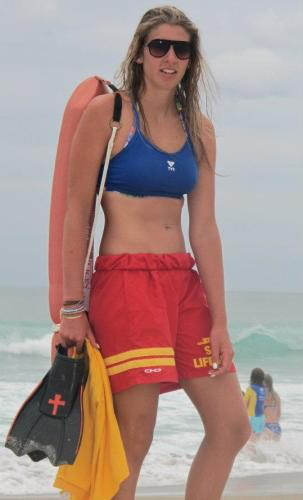 Gaining the Surf Lifeguard Award is a great achievement. 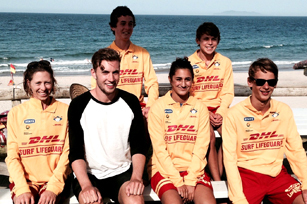 The club is very proud to welcome seven newly qualified lifeguards. 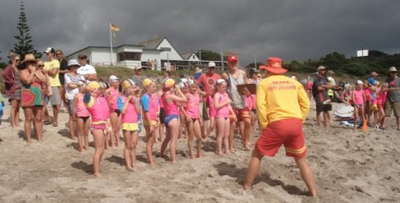 They were presented the Bronze Medallion, the surf lifeguard uniform and now they are ready to patrol. Alex did a wonderful job, training the group of seven. The group trained for three weeks during the xmas break. There are two other life-guards not in the photo and they are Marlon Khifi and Sophie McErlich. Once again, thanks to the fine summer weather, the holi-day activities were a great success and a lot of fun- a huge turnout of about 240 runners for the King of the Mountain race, a packed hall for the quiz night, happy fami-lies working together to create sand sculptures, messy kids face-planting in ice cream, a chilled crowd kicking back and enjoying Jazz by the seashore. It wouldn’t happen without them! While the focus of the holiday programme is on participa-tion and fun, the events also contributed significantly to the coffers of the Surf club. Many thanks to the awesome team of volunteers who or-ganise and make these events happen- Ross and Gail McCullough, Bill and Barb Doyle, the Jacobsen and Russell families, Edwina and Dave Russell and family, Andrew Hall and his band, Chris Hames, Ian Gage-Brown, Ruth Hanner, Lyn Clifton and Sunny Paul and all their supportive helpers. Also a debt of gratitude goes to the many and generous sponsors who provide donations and prizes for the events- Paul Greaney, Trevor Brown, Jacqui and Rob from the shop, Whangamata Real Estate, First National, Whiritoa Tennis Club, to name but a few. Some people have been running these events year in, year out, for some time now and would like to relinquish respon-sibility , so we are on the lookout for new blood. Also, while some events have become Toa traditions and are here to stay, we would like to freshen up the programme with some new events, but need ideas and people willing to run them. How can you contribute to your community? PS Does anyone know where the shield for the adults Tug of War is? Joanne Boyce, is the lady on the bar when I popped by. She lives in Auckland and has had her bach in Whiritoa for 11 years. She has two daughters, Georgia, 16 years old and Milly, 14 years old and is married to Steve. Daughter Georgia is a Whiritoa lifeguard. Joanne says that she is glad to able to give something back to the club by volunteering on the bar. Joanne started working on the bar at the end of last summer. Dean is the man who was in the kitchen cooking every night during the summer holiday period. He made burgers, chips, chips and more chips. 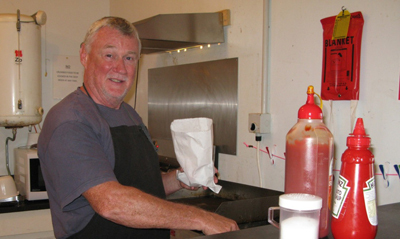 As more people realised that the kitchen was open, it got busier and Dean was keen to stay on working as long the business was there for the club. Not only is it a requirement of the Sale of liquor act to supply food, it also benefits the club for income. Mike Gray on the phones to his Agent, Murray Francis, passing on the good news. 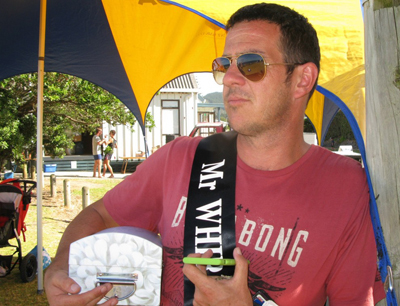 Mike Gray was crowned Mr Whiritoa in 2012 then again in 2014, and if the training regime goes well he will enter for a third time to win “Mr Whiritoa 2015”. Mike said that you will all notice that he did not enter in 2013. He said that he was going to enter but was too nervous and needed another year to get ready to defend his title again. “Apart from having good looks and loads of talent, what a lot of people do not realise is what it takes to get to this level”, Mike says. “It is pretty intense”. Leading up to the 2014 pageant, he spent six months at a yoga retreat on the Coromandel, which included fasting, meditation and tofu shakes. If you’re serious then this is what it really takes to be a winner. This year’s pageant was about titles, tiaras, sashes and tall stories. It was also about Mike’s acceptance speech; his promise to end the conflict in the Middle East, save the sand dunes, Dolphins, Whales and to donate his billion dollars to the surf club. The speech was inspiring, motivational, and it bought tears to our eyes. Mike wants to thank his agent, Murray Francis, for funding the yoga retreat. Mike is in the best shape of his life and wants his competitors to know that the stakes are high, and looks forward to next year…. 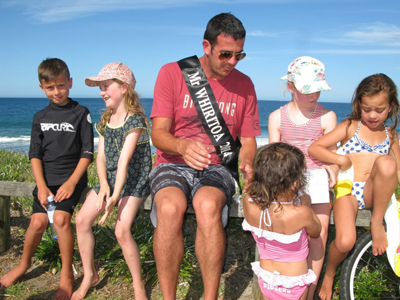 Every year at the end of the summer holiday, Whiritoa hosts the Nippers, Cadets and Rookies summer carnival. Participants from around the region come to Whiritoa to enter into the competition. This year the carnival was held on the 12th January. 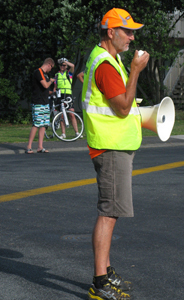 The weather was lovely and saw the competitors wearing the new “pink” rash vests. As usual it is all hands on deck and our lifeguards were around to help the organisers, this year it was Sarah Polglase and Libby Clifton. Our juniors did their club proud. Well done to all and especially Dom, who deserves a special mention as he was the most encouraging ‘helper’ on the day. He was excellent with his instructions and running in and out of the water helping the young competitors along. My name is Ariana. I am seventeen years old and in my last year of school at Epsom Girls Grammar School. 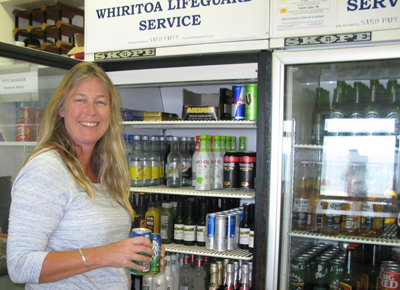 I have been going to Whiritoa for the past eight years and started in the surf life saving program as a nipper. I have also been heavily been involved in water polo and for the past three years I was selected to be the goalie for the New Zealand under 15, under 16 and then under 17 teams. I have travelled to Australia many times to compete nationally and have trained with many of the best coaches, learnt a lot and had a lot of fun. My favourite album is Rush of Blood to the Head, by Coldplay. My guilty pleasure is definitely my unhealthy obsession with Resese’s Peanut-butter Cups. My greatest discovery is that when you put marshmallows into the microwave they blow up and then turn into a sticky good-ness. The world needs less Justin Beiber look alikes and less of Rob Fords shenanigans. My most favourite things in the world are long runs in the morning, the youtube channel “thesoundyouneed”, my bed, bik-rim yoga, the feeling you get straight after going to the super-market, hanging on the surf club viewing platform on a mattress, Caesar Salads and bodysurfing on a beautiful morning at Whiritoa. ← Level One First Aid Course – 5 July. Hey..it is great seeing the newsletter in this version. ..enjoyed reading the articles again. .